Nearly 50 years ago Lockheed chief Kelly Johnson and test pilot Tony LeVier planted a seed in the barren southern Nevada desert. With the dedication of many individuals throughout those formative years the seed sprouted into one of our country's greatest assets, the U-2 Dragon Lady and the A-12 Archangel photo-reconnaissance aircraft. These Silent Heroes of the Cold War, the Roadrunners, protected our nation during the tense and anxious times of the 50's and 60's. Their families braved untold sacrifices as their loved ones worked in obscurity on highly classified projects to ensure our freedoms. 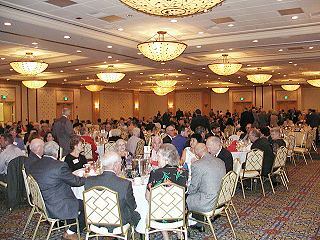 In September 2003 more than 300 of the pioneers including, support personnel, contractors, and their guests gathered together not too far from that dusty lakebed at Area-51 on the Nevada Test Site for the 18th Roadrunners Reunion in Las Vegas, Nev. It was a time for fellowship, exchange of anecdotes and fond memories. Members of Roadrunners Internationale brought families and friends from all over the country for a week of tours and golf, culminating in a dinner highlighted by a moving Power Point presentation depicting the Roadrunner's heritage. Our Cold War Warriors began arriving on Monday, September 29 at the Gold Coast Hotel to settle in for the week's festivities. Two "Roadrunner Command Posts" served as hospitality suites, offering Roadrunners the opportunity to visit, renew old friendships and enjoy refreshments. Roadrunners had a chance relive the "old days" as they viewed Frank Murray's scrapbook, which includes news articles, photographs and memorabilia form the U-2 and Oxcart programs. Also on hand was Doug Nelson from the Blackbird Airpark. offering a variety of commemorative items for purchase. Tuesday was a full and stimulating day as 120 Roadrunners boarded three buses for a trip to Nellis Air Force Base where they enjoyed lunch and a film at the NCO club. Nellis being the home to the Air Warfare Center, the Thunderbirds, Red Flag and the Threat Museum offered visitors an inclusive tour of the facilities and a bus ride down the flightline. Some of the Air Force newest fighters, the F/A-22 Raptors stood proudly on the ramp to pose as the Roadrunners enjoyed a quick photo opportunity of these multi-role aircraft. 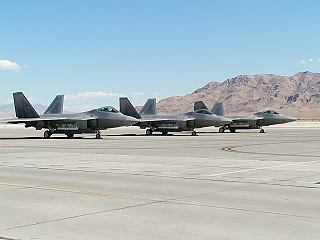 The Raptor is currently going through test and evaluation on the Nellis ranges. Then it was off to the Red Flag facility for a briefing on the training exercises where military personnel from across the globe descend on Nellis for training. The Threat Museum run by the 57th Intelligence Squadron offered the opportunity for some of us to sit in the cockpits of Russian Migs. 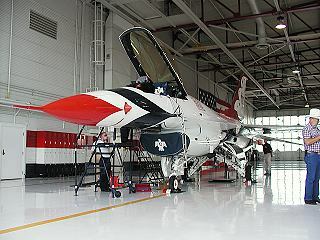 The Thunderbirds hangar was the final stop on the tour. The Roadrunners were privileged to meet some of the crew and support personnel and see a Thunderbirds film. As a symbol of thanks for paving they way in the future of our country's freedom, the Thunderbird's presented the Roadrunners with a beautiful signed 50th anniversary poster. On Wednesday, duffers had a chance to show their golfing expertise at the Lin Kelly Memorial Golf Tournament. Seven foursomes participated with Sam Ursini & Rose Marie Sullivan taking first place men's & women's low score honors. Rose Marie also won closest to the hole for the women and Lee Andersen for the men. Others enjoyed the range of tourists' attractions the Las Vegas area has to offer, including the beautiful parks, shopping, and of course, the casinos. Thursday, after the membership meeting the Roadrunner's enjoyed a detailed recount from John Whittenbury of the technical challenges of those having the task of designing and building the A-12. More than 100 Roadrunners and guests spent the afternoon at a special "sneak preview" of the new Nevada Test Site Museum. Here, visitors got a glimpse of what is in store for the new "virtual reality" style museum. A Cold War traveling exhibit from Francis Gary Powers, Jr., son of the late Francis Gary Powers, U-2 pilot, offered the Roadrunners a chance to see the memorabilia of Power's shoot down incident by the Russians in 1960. 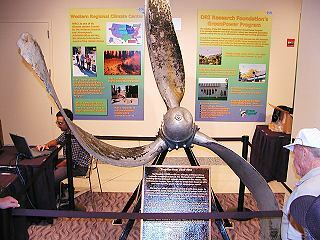 The propeller from 1955 ill-fated crash of a C-54 transport plane that was carrying workers to Groom Lake reminded us of the sacrifices made by our Cold War heroes. 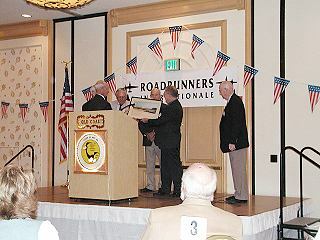 Two beautifully framed photographs, provided by Roadrunner Mike Schmitz, one of Francis Gary Powers and the other of the five Oxcart Project Pilots, were donated to the museum on behalf of all Roadrunners by RI President Roger Andersen. Over 285 Roadrunners and friends had the opportunity to hear guest speaker, Dr. Bud Wheelon who -- spent his professional life in the world of science and advanced technology, share his recollections of the reconnaissance programs during his tour of duty with the CIA. In 1962 Wheelon joined the CIA and served as Deputy Director for Science and Technology until 1966. Dr Wheelon was responsible for technical collection and analysis activities including U-2 overflights, development of the SR-71 and the Corona reconnaissance satellites. The evening culminated with a stirring PowerPoint presentation created by Roadrunner's Webmaster, TD Barnes, who was presented a special signed photograph of an A-12 from Oxcart pilots; Ken Collins, Jack Layton, Frank Murray and Denny Sullivan for his superior efforts. Barnes spectacular and inspiring work depicts the heritage of the original Roadrunners who years ago, -- concealed in the high desert of southern Nevada, dedicated themselves to a very special project that helped protect our country during the Cold War.